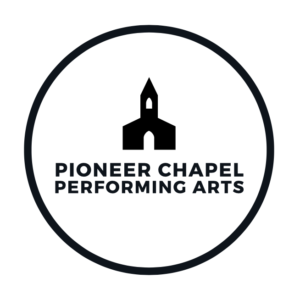 Canby Pioneer Chapel Performing Arts are growing and becoming a part of Wilsonville’s emerging business community! 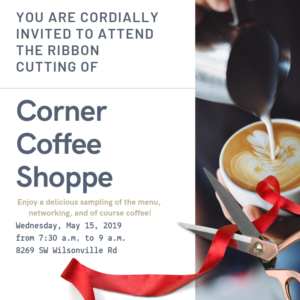 Please help us welcome Canby Pioneer Chapel Performing Arts to the Chamber by attending their Ribbon Cutting Ceremony of their new outdoor event space! Wine and appetizers will be served to the sounds of John Nilsen playing live on the Chapel’s beautiful grand piano. The Chapel’s famous tea sandwiches and desserts from Lux Sucre Desserts are not to be missed! Enjoy these treats while taking in the fresh air of the Chapel’s blooming English garden. The event starts at 5 PM and Ribbon Cutting will take place at 5:45 PM. Following the event, Chamber guests will receive half off admission for the 8 PM performance of John Nilsen. Since 1884 “The Canby Pioneer Chapel” has proudly shared a very strong heritage and history in the city of Canby Oregon. It is one of the grandest and oldest structures in the state of Oregon. This lovely white-frame building augmented by a steep 40-foot bell tower, in classic Gothic Revival Style, is now the home of Canby Pioneer Chapel Performing Arts. The “Canby Pioneer Chapel” is a magical performing arts center that is the place for concerts, lectures, recitals, corporate events, and parties. It is a charming venue that truly captivates the heart when you walk the English garden or enjoy the glorious performing arts center. Owner, Marilyn Nash has been an entrepreneur and supporter of small businesses her entire life. In 2016 she received the prestigious Canby Chamber of Commerce Community Choice Award for her tireless efforts in supporting the arts and beautification of the city. Her love of music and performing arts will bring to Canby the finest in entertainment and performers from the Northwest and across the country. Parking: Ample street parking on Elm and 3rd street. Overflow parking in the shared lot of the Church behind the Chapel. Area young professionals are invited to the world famous Atomic Lounge above World of Speed Motorsports Museum! We’ll step back in time to network amongst the swanky and authentic mid-century décor. “Groovy Baby!” Raffle prizes include tickets for two to the Motorsports Museums! Arrive early for FREE access the new Mario Andretti exhibit and get a taste of all that World of Speed has to offer. The museum will be opening their doors to us from 5pm to 6pm. Social media is evolving daily and the challenge for today’s business person is to stand out in a crowded and noisy online world. You can break through the clutter and use your expertise to set you apart from the competition and create the business that you truly desire. Participants will walk away with the knowledge to pick their platform of choice that makes the most sense to their business and execute to set themselves apart from the crowd. Andy’s experience in using social media to create one of the top real estate businesses in the metro Portland market is a proven blueprint on how you can not only generate more sales but position yourself as the expert in your industry to provide more opportunities and help you accomplish your professional goals. Andy is an entrepreneur, real estate biz owner, coach and trainer. He believes the real estate agent has direct control of their success. He believes in simplifying the process. The way he impacts agent’s success is by changing the way they think, providing simple to follow plans and coaching them to success. His company has given back over $100,000 to the local and worldwide community. 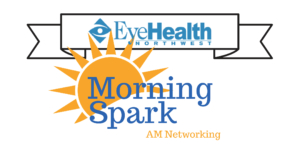 Let’s celebrate new Chamber member EyeHealth Norhwest with a ribbon cutting ceremony! With more than 60 years of experience in Portland, we are now driving the Portland look by designing and curating original frame collections based on our optical expertise – Bridge City Spex. We understand the importance of individuality, functionality, and quality. The Bridge City Spex Collections can be found exclusively at our eleven EyeHealth Northwest optical shops. 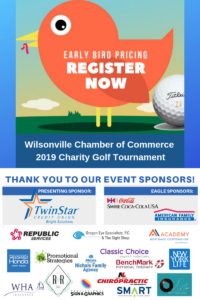 The Wilsonville Area Chamber of Commerce invites you to join them as a guest for their 4th Annual WACC Charity Golf Classic. 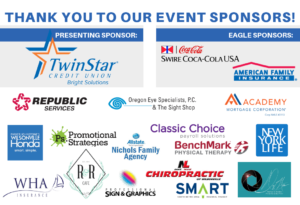 The Wilsonville Area Chamber of Commerce invites you to join us for our 4th Annual WACC Charity Golf Classic. Teams will play 18-holes in a four-person scramble with a Shotgun start. Fees include golf cart, continental breakfast, lunch, complimentary refreshments, team photos, awards, raffle items and unlimited use of the driving range before the scramble.